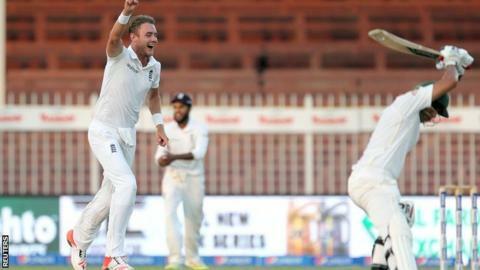 England struck late on day three to leave the third and final Test against Pakistan evenly poised in Sharjah. Pakistan looked set to take control when a century opening stand between Mohammad Hafeez and Azhar Ali wiped out England's first-innings lead of 72. But three wickets in the evening session left Pakistan 146-3, a lead of 74, with Hafeez still there on 97. England were earlier all out for 306, James Taylor adding two runs to his overnight 74 and Samit Patel making 42. The tourists require further wickets early on the fourth morning if they are to face a manageable fourth-innings chase on a pitch that is likely to offer yet more assistance to the spinners. Alastair Cook's side need victory to avoid a series defeat. That England remain in contention is largely down to efforts of seamers James Anderson and Stuart Broad, who tirelessly stifled the Pakistan charge after the tourists' trio of spinners again disappointed. England seemed unlikely to make a breakthrough until Azhar was run out in a comical mix-up with Hafeez. In the following over and with the ball reverse-swinging, Anderson persuaded Shoaib Malik to kick away a ball that would have cannoned into middle stump. And, with only 14 deliveries left in the day, Broad got Younus Khan in similar fashion, the right-hander not saved by a review which suggested the ball was taking the top of off stump. England's main task on the fourth morning will be to remove Hafeez, who made the most of some good fortune to move to the verge of a ninth Test century. He was given out caught behind on two off Anderson, only for third umpire Paul Reiffel to decide there was enough evidence to overturn the on-field decision, despite having nothing other than inconclusive television replays at his disposal. And, on 11, Hafeez edged Moeen Ali, offering a very tough chance to Jonny Bairstow that hit the wicketkeeper's thigh and fell to the turf. Reprieved, he combined with the obdurate Azhar, who also could have been given out lbw to Patel, for a first-wicket stand worth 101. While England can rightly say that they created opportunities, their slow bowlers once again left too much work for Anderson and Broad. On a pitch helpful enough to give the Pakistan spinners eight wickets, Adil Rashid, Moeen and Patel neither created opportunities nor stifled run-scoring. While Azhar milked the singles that were too readily available - his 34 runs were scored from 115 balls without a single boundary - Hafeez played the aggressor. He dispatched Moeen and Patel for a straight six apiece, heaved an Anderson slower ball over the leg-side fence as well as playing a number of eye-catching strokes through the off side late in the day. While Patel was culpable in the England spinners' combined figures of 27-3-90-0, the Nottinghamshire man marked his first Test appearance for three years with his highest score. Arriving at the crease after an out-of-sorts Taylor poked Rahat Ali behind, Patel scored freely, particularly against the spin bowlers. His 42 included some flowing drives through the off side and was only ended when Yasir Shah produced a vicious leg-break that pitched on leg stump and clipped the top of off. That was part of a slide that saw England lose their last four wickets for 21 runs, including the injured Ben Stokes - who will not bowl again in the game - batting at number 11 for a 10-ball duck. Malik's error in allowing an Anderson inswinger to hit his front pad would turn out to be the last ball he faced in Test cricket, with the 32-year-old announcing his retirement from the longer form immediately after the close of play. Recalled for this series, the right-hander made a career-best 245 in the first Test, but has since managed scores of only 0, 2, 7, 38 and 0. However, he has still contributed with the ball - taking a career-best 4-33 with his off-spin in Sharjah. "Family comes first," said Malik, who is married to Indian tennis player Sania Mirza. "This is the right time to say goodbye to this format."